I first heard the call to enter the priesthood during my senior year of college. I was encouraged by good friends, some of whom were discerning themselves. I attended St. Thomas More School, Allentown and then went to Emmaus High School, where I graduated in 2010. I studied at the University of Notre Dame, where I earned a degree in anthropology and premedical studies in 2014. I finished a master’s degree in education in 2016 through the Alliance for Catholic Education (ACE) program at Notre Dame. During my senior year in college, I wrote a Gospel reflection for FaithND, a network through the ND alumni association that distributes a daily Gospel reflection to the wider Notre Dame community. That comment stuck in my mind as I continued to grow in my relationship with God. Over the next three years, my friends and family encouraged me with what they saw were talents, skills and dispositions that could be put to good use in the priesthood. When I moved to Philadelphia to start my third year of teaching, I received spiritual direction in the Allentown Diocese, which also was encouraging, and so I decided to apply to the seminary. I was supported by many mentors, both priests and laity. Over the course of the next three years, I took advantage of many discernment retreats to better understand God’s call for me. My grandparents were devout in their Catholic faith. They set a good foundation for me. My parents sacrificed much to help me be successful in my youth. My extended family and I have been close and they have been supportive as I explored my calling to enter the seminary. Finally, my friends at college were extremely meaningful in showing me the joys of living a virtuous life. I enjoy cooking, running, hiking, listening to music, acting, playing sports, playing board games, singing and being in the company of my friends and family. As a seminarian, our life is rooted in prayer. We have a very structured day that helps us to be joyful. We spend time in both private and communal prayer. We eat meals in community, go to class together, study, and spend our free time exercising and socializing. 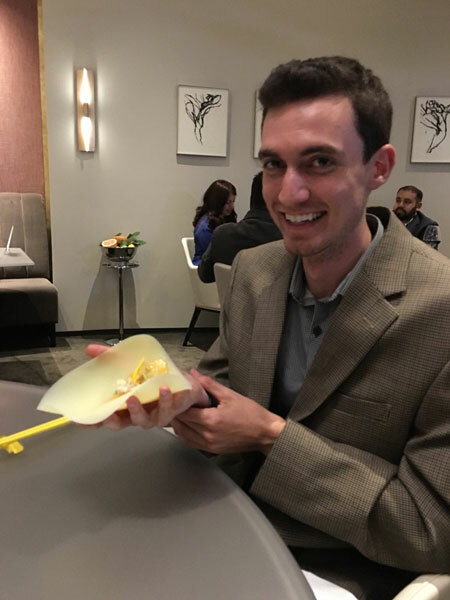 Robert Rienzo, diocesan seminarian, enjoys a taco at Alinea while on a trip to Chicago, Illinois.